A few fun and nice things for you! Firstly, UK flutist Thomas Sargeaunt has given us for free, two very beautiful pieces. You'll have read on my blog, about the Bach Chaconne bwv 1004, (pdf) but he has also very kindly offered a second Baroque/Romantic Chaconne for free! It is the Vitali Chaconne, Piano accompaniement by Charlier and, if you'd like to read about this 1850s Chaconne, there are program notes here, and a good flute performance on youtube. pg. 11-15 (scroll down in pdf): program notes in depth. Performance on flute of another transcription: youtube. 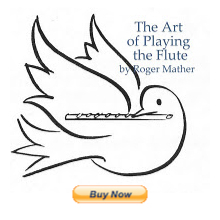 If you're looking for MORE free pdfs of flute sheetmusic online, some online resources are here. A decade ago I interviewed James Galway, James Boyk, Nathan Zalman, and other great teachers, and had FIVE interview segments with stage-fright expert, trumpeter/author, Michael Goode (episodes 3-7). All of these were combined with audio flute recordings and called "Fluteloops". The sound quality of the old-style skype-phone calls recorded on mini-disc, is really nostalgia inducing, ha ha. So sound-quality apologies in general, and yes, episode 11 is the final one.